Round 34: Featuring Southern California Funnies, including the "Mako Shark" Corvette, Mark Susman, Eddie Pauling, the Plueger & Gyger Mustang, the "Hellfire" Corvette, Mike Halloran, Bob Hankins, John Hoven’s "Mach I," Mert Littlefield, and the Beebe Bros.
Eddie Pauling was a great funny car driver from the state of Arizona. His driving career lasted from 1967 to 1977 with a break in 1974 and 1975. 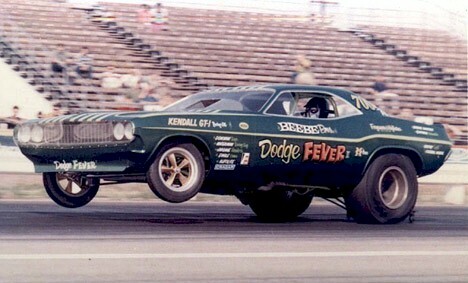 He is most famous for the "Lil' Hoss" funny cars he drove for Johnny Loper. Pauling also had his own series of "Whinemaker" funny cars. Eddie was not afraid to try new ideas. The first two funny cars he drove were 392 Chrysler powered rear engine machines. The first, called the "Ol' Whine Maker," was a '66 Dodge Dart, and the second was a '68 Mercury Cougar called the "Whinemaker." They were somewhat successful, but Pauling decided to go mainstream with a conventional '69 Mustang. It was soon to be outdated due to rapid changes in funny car racing. "Plain bad" is a simple way to describe the Plueger & Gyger 1973 Mustang. The Donovan-powered machine was one of toughest cars to beat on the West Coast during the mid-seventies. Co-owner and professional chassis builder Steve Plueger built the car. It did not seem to matter who was the driver at the time -- the car performed and put up victory after victory. John Collins, Dave Condit, Gerry Glenn, Fred Mooneyham, and Dale Pulde all drove the killer black Mustang. Condit had the finest hour in the car when he recorded an amazing 6.19 at Ontario in 1974. This was Plueger's most successful FC effort, as his first Corvette crashed with Wendall Shipman at the wheel. 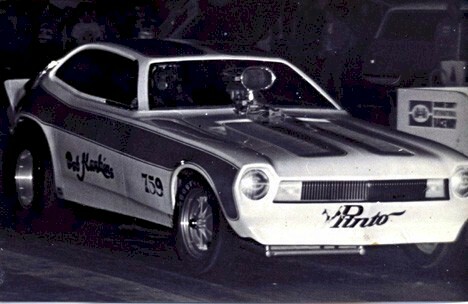 Plueger also teamed with "Lil' John" Lombardo on a Vega that went a 6.69 in 1972. Next came the Mustang. Plueger retired in 77. 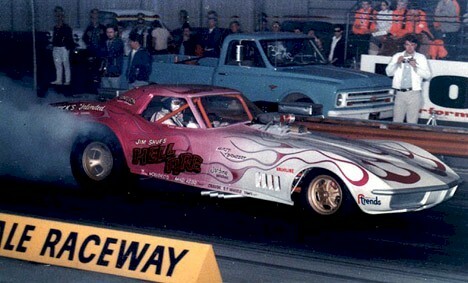 The "Hellfire" Corvette was one of the sleekest funny cars of its era. The team of Jim Shue and Johnny Wright formed in 1969. 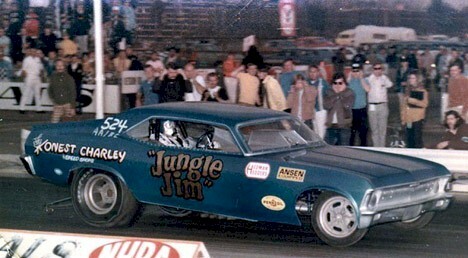 Wright had previously driven the "Lorenz and Wright" Chevy II, which used to be Dale Armstrong’s Canuck, and the Wright Bros. Camaro. Jim Shue spared no expense for the performance and look of the car. The team was one of the toughest in 1969 and 1970 in Southern California, hitting the mid to low seven second range at 200 MPH. 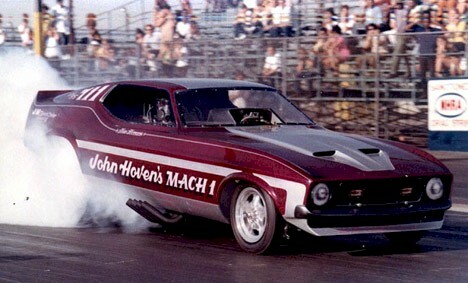 John Hoven’s "Mach I" is remembered as one the best looking funny cars of the seventies. The team had previously raced in the SoCal AA/FA Wars. Hoven was a partner in the Way, Hoven, and Okazaki 23T. 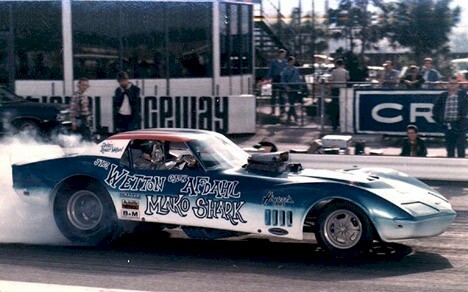 Driver Tom Ferraro had driven both fuel altereds and funny cars. 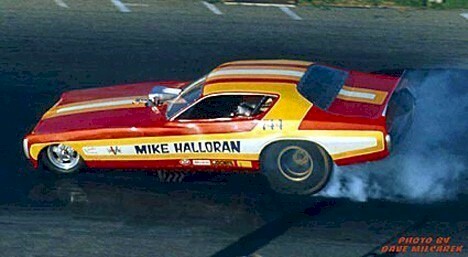 The funny cars he drove were the unusual Genuine Suspension "AMX-1" Javelin and the equally unusual rear engine "Javelin 1" of Doug Thorley. The fuel altereds Ferraro drove were the Genuine Suspension Fiat and the Campos Bros. "Low Blow" 23T. It was in the "Low Blow" that Ferraro almost died of serious burns. Tom's turn in the "Mach I" was his return to racing after the fire. Hoven and Ferarro did not enjoy the winning success that they had in fuel altereds, a problem shared by other converts to funny cars from fuel altereds. The cost of racing a successful funny car was higher than for an altered. Mert Littlefield is one of the most respected blower manufacturers in all of drag racing. A Mert Littlefield blower is instantly recognizable by the small round yellow decal on the side of the blower. 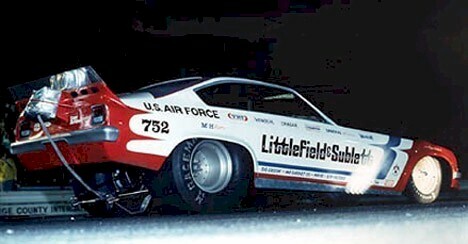 As long as Mert Littlefield has built superchargers, he has raced funny cars. Mert began with an ex-Mike Miller Dart he called the "Rapid Transit." The car was raced until 1971 with a new Charger body. Mert burned the to the ground, ending the "Rapid Transit" series. Littlefield built a new Vega in 1972 with his new partner Sublett. Mert began to have his first success in nitro racing with the new car. That success led to the sponsorship with the U.S. Air Force in 1974. The sponsorship was not the size of Don Prudhomme’s Army, Tom McEwen’s Navy, or Mickey Thompson’s U.S. Marines deals, however.